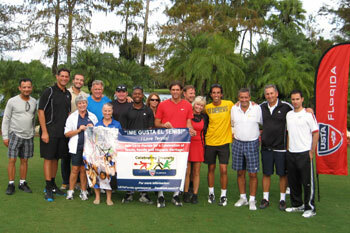 USTA national's Diversity and Inclusion department in cooperation with USTA Florida presented a Latino Tennis Coaching Workshop titled "How Hispanic Coaches Can Impact Tennis Development in the U.S." on Nov. 16, 2012, at Banyan Golf & Country Club in West Palm Beach. "The participation from the coaches was fantastic," said organizer and keynote speaker Gustavo Granitto. "The input during the presentations, the discussion about the potential of the Hispanic market, and discussion on coaching methodologies showed the interest of coaches to be even more effective in their work. 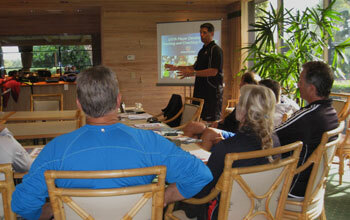 The personal attention of Banyan Country Club Director of Tennis Alex Ringwald made a perfect venue for this workshop." Other speakers included David Ramos from the national USTA Player Development Coaching Education department, presenting USTA 10 and Under tennis Coaching Philosophy, and additional technologies and tools for tennis coaches; and USTA Florida board member Nancy Horowitz also explained avenues of opportunities that USTA Florida offers to all members. "The club, speakers and the material presented were all was very good," said attendee Rafael Curbelo. 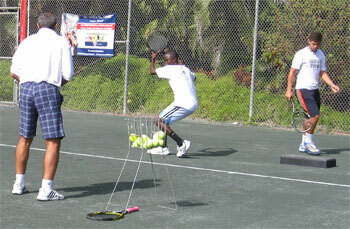 The Hispanic workshops, which originated in the USTA Florida Section, are now being piloted by USTA national. "Latino coaches can substantially impact tennis development and competition in the United States, providing more tools to attract, retain and develop more people playing tennis," said USTA Florida's Shelly Licorish on the vision of the workshop. "Considering that there are more of 53 million Hispanic-speaking people in the U.S., these workshops are an excellent option for Hispanic and non-Spanish Speaking coaches to expand and improve their business." By the end of the workshop, coaches were able to: produce tangible benefits in new areas of their job; discover their own level of competencies; engage with leaders in 10 and Under Tennis, Recreational Development, High Performance and the tennis industry; engage the potential market of 53 million Latinos; and embark on continued education and networking in their USTA Section and the rest of the U.S.
Granitto will continue the tour of the USTA Diversity Latino Coaches Workshop series in Mountain View and Riverside, Calif., on Dec. 7-10, 2012. For more info contact gusg@gtctennisconsultancy.com.